If you live in Montana, North Dakota or Wyoming and you know that you need help with an I-212 waiver, you are in the right place. Please keep reading for more information about the waiver. If you want more information on waivers generally, you can review waiver guide. If you know you need help, please contact us. 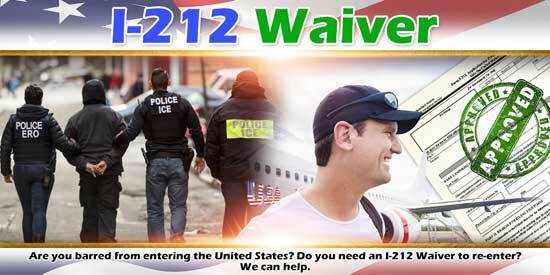 You need an I-212 waiver if you have been removed from the United States previously. Two agencies remove people from the US, Immigration and Customs Enforcement (ICE) or Customs and Border Protection (CBP). That removal is either an expedited removal by the agency making the arrest or removal ordered by the immigration court after the agency placed you in removal proceedings. Once you have been removed, you usually find out about the need for the waiver through the nonimmigrant or immigrant application process. An example often makes abstract concepts easier to understand. Let’s work one here. Joe goes to Mexico and marries Caroline and returns to the United States promising to file the immigration paperwork so Caroline can come to the United States. Caroline gets tired of waiting. So she attempts to come to the United States as a tourist. When Caroline makes application to come to the United States she is questioned and admits being married to a US citizen. in her entry CBP find immigrant intent and as she is an arriving alien, give her an expedited removal order. She is now banned from United States for five years. She needs the I-212 waiver in order to enter the United States before the five year ban is up. The I-212 waiver is unusual in that it has no prerequisites like a qualifying family member. Moreover, you don’t have to meet any specific statutory standard in order to apply. The USCIS considers your application on a case-by-case basis. Also, USCIS considers all relevant information. Courts often end up setting the requirements and scope of immigration waivers, and the I-212 waiver is no different. The Board of Immigration Appeals found that the USCIS should consider at a minimum the following factors: 1. The basis for deportation; 2. Recency of deportation; 3. Length of residence in the United States; 4. Moral character of the applicant; 5. The applicant’s respectful law and order; 6. Evidence of reformation rehabilitation; 7. Family responsibilities of applicant; 8. Inadmissibility to the United States under other sections of law; 9. Hardship involved to the applicant and owners; 10. The need for the applicant services in the United States. If you combine these factors with the intent behind the I-212 waiver, Congress intended to give a removed alien a second chance, you find that the USCIS is generous in reviewing I-212 waiver requests. Congress’s idea was that the I-212 waiver is remedial in nature versus punitive. How an applicant applies for an I-212 waiver depends on the immigration benefit sort, an immigrant or nonimmigrant visa. It also depends on whether the applicant needs any other waivers in conjunction with the I-212 waiver. Different rules apply also if you are visa exempt like Canadians, or you already inside the United States. We can and do help with all aspects of the I-212 waiver process. We have then successfully prepared and filed these I-212 waiver applications. If you are unsure about the need for this waiver or any others, we can also help you work through what you need. For all your waiver needs, please contact us.